The external vacuum packaging machines by DURAPAK work with specific bags (channel or three layer bags) or with specific rigid boxes. All the vacuum packaging machines are built in Stainless Steel, have small dimensions and are user friendly. These vacuum packaging machines are equipped with a sealing bar and can work either in manual or, on some models, in automatic cycle simply setting the vacuum and the sealing time. 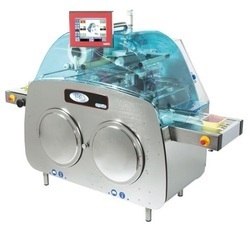 These vacuum packaging machines are widely used in restoration, catering and domestic field. Meat processors, seafood processors, dried fruits, produce suppliers, dairy, commissaries, sandwich producer, large scale kitchens, pasta and sausage factories, farms. we are leading manufacturer and exporter of cling wrapping machines, automatic cling wrapping machines and wrapping machines. The industrial technology is the answer to industrial packers and hypermarkets needs, that is to all the applications where the productivity is an essential requirement. The industrial series machines are very much appreciated for their reliability in extreme operating conditions. The excellent performances provided and the remarkable lay-out flexibility make them the ideal solution for stretch wrapping of trays containing fresh foods such as meat, poultry, produce, cheese, fish and other products like bakery, confectionery and pizza. 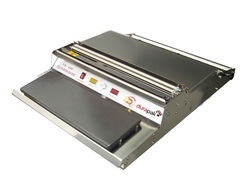 Mini Spenser is the very easy to use manual dispenser for Cling film by DURAPAK. 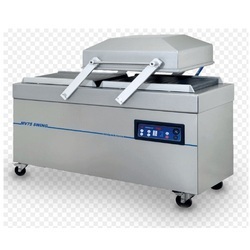 Extremely operational and easy to use, it is perfect to pack food products. 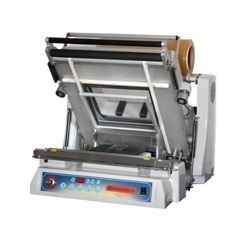 These cling wrapping machines are made of stainless steel, easy to clean and to operate. The hot plate temperature can be easily regulated. It is CE approved. The patented Elixa technology represents a perfect synthesis of electromechanics, polymeric science, continuous attention to customers' needs and a strong environmental awareness. 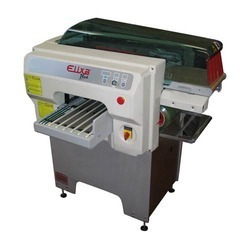 The Elixa series machines are completely automatic they electronically read the trays and product dimensions as soon as the product lays on the machine in-feed, the, and by a specific software they choose the best wrapping program. 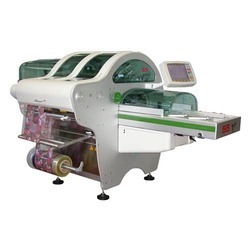 The machine parameters are immediately arranged to the choice, giving back the product perfectly wrapped to the operator. Another Elix peculiar feature is the 4-direction film stretching, a patented system which makes the machine unique in the world. Such characteristic allows the operator to wrap all trays utilizing only one film reel width, having remarkable advantages for managing and cost savings, together with a considerable environmental impact return that one may have from a material saving reaching up to 40%. This technology offers the best benefits to those who want to pack products with variable sizes and is looking for maximum flexibility at the same time. Used in butchery, poultry, fish, fruits and vegetable and delicatessen departments of the GDO. Appreciated for its specific reliability and efficiency characteristics even in small packing centers. Utmost film saving in synergy with durapak stretch films. The Topseal technology is a peculiar packaging system that allows the "sealing" of a tray with a thin film. It can be applied to trays and films both in plastic material and in aluminum. Topseal series machines manufactured by Gruppo Fabbri allow gas exchange both in vacuum and in a patented flushing system. With the same machine it is therefore possible to pack using the protective atmosphere, as well as the tray-sealing and the vacuum. Simple to use and reduced running costs. Reliable and with productive output that can satisfy also large sized packing centres requirements; flexible and simple to use in GDO too. Looking for Food Packing Solutions ?